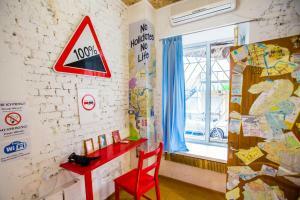 Offering free WiFi, 7/11 Inn offers rooms in Vladivostok, 3.2 km from Eagle's Nest Hill. The property is set 5 km from Zolotoy Rog Bay. The property offers a 24-hour front desk. The units in the inn are equipped with a TV. The rooms are equipped with a kettle and a private bathroom with free toiletries, while some rooms are fitted with a kitchen fitted with a microwave. All guest rooms include a wardrobe. The nearest airport is Vladivostok International (Knevichi), 51 km from 7/11 Inn, and the property offers a paid airport shuttle service. When would you like to stay at 7/11 Inn ? Each day we'll check prices and send you an email for your selected dates at 7/11 Inn. If you don't have specific dates but would like to check prices for say next weekend or say next month we can check the price too. Click to write a review and share your experience of 7/11 Inn with other travellers.